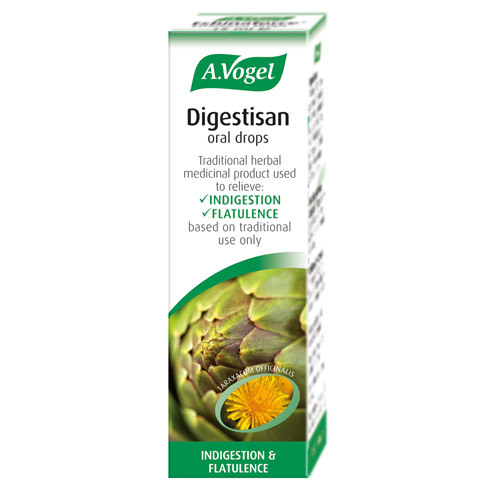 Unlike other herbal indigestion remedies, A.Vogel’s Digestisan comes in the form of a herbal liquid tincture. Take 15 to 20 drops three times a day to help relieve the symptoms of indigestion. Allergic to any of the ingredients, plants of the daisy (Asteraceae / Compositae) family, or to Menthol. Suffering from blockage of the bile duct or intestine, inflammation of the bile ducts and other biliary disorders, gallstones, liver disease, kidney or heart failure or diabetes. Taking another medicine that is affected by alcohol. Below are reviews of A Vogel Digestisan - Indigestion - Tincture - 15ml by bodykind customers. If you have tried this product we'd love to hear what you think so please leave a review. Great product for resolving indigestion.Helps resolve bloating too. This is an excellent remedy for indigestion - and it's natural. I certainly recommend it. 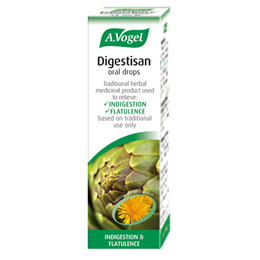 A Vogel Digestisan is a traditional herbal medicinal product used to relieve indigestion, feelings of fullness and flatulence associated with over-indulgence in food or drink or both, exclusively based upon long-standing use as a traditional remedy.